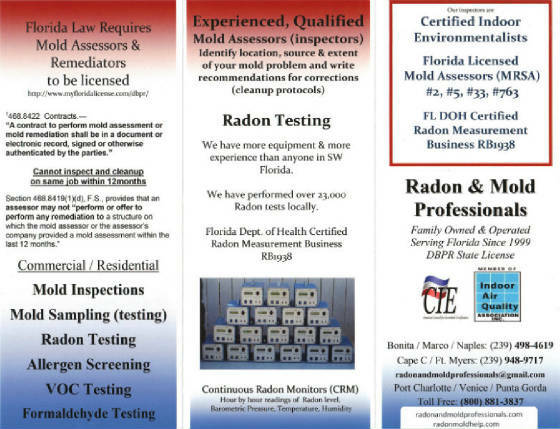 Mold inspection prices in Naples-Ft Myers area vary mainly because of experience and the extent of documentation. A proper mold assessment takes a couple of hours even in a small condo. Every accessible area needs to be scanned with infrared cameras and visibly checked with lights; many areas need to also be checked with a moisture meter. Experience is the key to "looking" for mold problems and sources. Many inspectors fail to look under furniture or behind drawers for example. 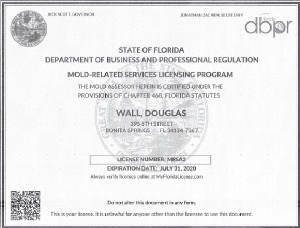 Do the mold inspection right takes time; this is the problem most inspector have. If they are hired for one service, home inspection for example, taking enough time to perform the mold assessment would cause them to charge much more and they would not be competitively priced for home inspection. This "catch 22" is a problem, if the HI charges enough to cover his time to document all the problems and sources of mold, they cannot compete with the HI that does not. In the real world uninformed agents, homebuyers and consumers mostly want to hire the "cheapest guy". The public doesn't understand or really care, in our experience, which is about 10,000 mold inspections. A detailed report with good documentation of problems and sources along with recommendation for cleanup if needed can save the client money in the long run. When you get bids for mold removal / cleanup, the remediator needs to know exactly where and what needs to be done. Please contact our office for properties larger than shown above for price quote. Payment Terms: We accept Cash, Check, Visa or MasterCard at the time of the inspection unless other payment arrangements have been agreed upon. 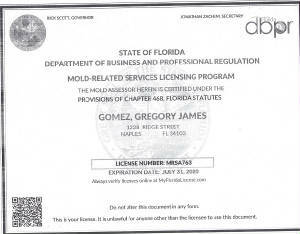 Additional charge for Hard Copy (printed) of Mold Report. The term "toxic mold" is not accurate. While certain molds are toxigenic, meaning they can produce toxins (specifically mycotoxins), the molds themselves are not toxic, or poisonous. often used in Real Estate to determine if further investigation is needed, also helps determine the extent of a mold contamination. Air Sampling only: “Mold Air Sampling only” is often used to determine the extent of a airborne mold problem. Air sampling protocols recommend an air sample be collected by the main return area of each HVAC system. If home is a 2 story structure, an air sample is recommended on each floor. · An outdoor sample (baseline sample) is also required. · Minimum air sampling (mold testing) is one sample outdoors and one sample indoors. · For insurance claims a surface sample of any visible mold is generally required (tape lift or swab). We use Infrared cameras, moisture meters, etc. We provide source identification, documentation of extent and amplification of mold, photo documentation with recommendations for corrections based on nationally accepted industry standards such as S500 & S520 for the accessible indoor living space. 5) determine the indoor air quality as it specifically relates to aerosolized mold spore concentrations (i.e. consistency with normal fungal ecology). Air sampling only for mold (which is commonly performed with a “home inspection”) should not be relied upon as a conclusive determination about a given property’s mold condition. Air sample analysis is useful and valuable information however it does have significant limitations. For instance, air sampling data will not identify the “source” location(s) and all too often can show a non-elevated airborne condition (i.e. passing air samples) even though a mold problem exists within the home. The above criteria are not typically included with a general “home inspection” that is primarily designed to identify “functionality” issues (i.e. what works and what doesn’t work) of a given home. All too often, we receive air sample reports showing elevated airborne concentrations yet the inspector doesn’t identify the actual source of the problem and defers them to a remediator. Unfortunately with this scenario, the remediation company doesn’t know the source either and there ends up being more questions than answers. Conversely, we have seen countless passing air samples yet a mold problem is found after the fact. At the end of the day, do not rely on air samples only or air samples performed with a “home inspection” to give you a conclusive perspective of the property’s mold condition. If mold is a concern, have a mold assessment and not just air samples. It will save a lot of time and money to do it right from the start. 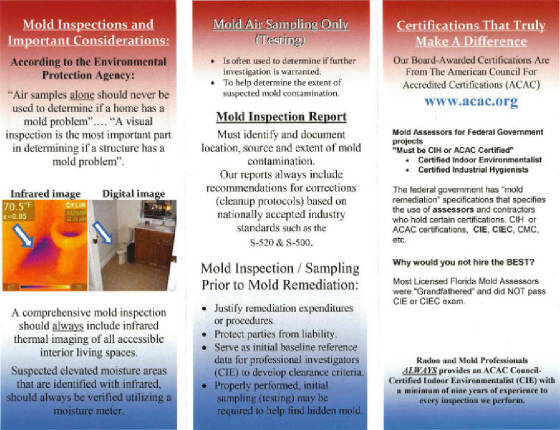 Our mold / radon and all IAQ assessments are always done by a ACAC board Certified Indoor Environmentalists.